Ten years ago at dinner time on Valentine’s Day I sat down to a special dinner I had created for myself of low-fat vegan fare. It was to be my first official day of eating this way, and i wanted it to be special and delicious. I wanted it to be a celebratory start to turning around the association of Valentine’s Day with the diagnosis of MS–which I received on that day in 1996. I had recently discovered Susan’s Fat Free Vegan Kitchen and two of her offerings were centerpieces for my dinner: Easy Vegan Spinach Mushroom Lasagna and Skinny Figgy Bars for dessert. I also had a salad with some kind of fat free dressing I no longer remember exactly, or maybe a side of steamed broccoli. I lit some candles. I sat at the table with my lovely plate in front of me and a cloth napkin on my lap. I didn’t know how much this choice would help me, or how I’d later get to know Susan and she’d invite me to write this blog. I was just following a hunch. And I always like reinventing or altering something hard into something to celebrate. A lot has changed in the last ten years. I still make that lasagne every once in a while, and I still love those figgy bars. But things have gotten more simple. And along the way I fell in love with particular whole foods themselves that I’d never tried before and thought I hated (for instance, persimmons and rhubarb) to returning to those I’d always loved with a more clear set of taste buds and appreciation, like pomegranates. They became the centerpiece for art and cards I made when I had my first solo art show in 2014 and were for sale for a limited time at the store page of this blog. Here’s a link to that post for more backstory on what Valentine’s Day has meant to me, and to see those illustrations. In these last ten years, I’ve continued to grow as an artist and a blogger. I’ve finished a quilt I started when I was first diagnosed–by hand–after 19 years (Stitches in Time). Over 5 years I became more able to do light gardening on a regular basis. When I got Romeo, I started walking twice a day and the length of those walks gradually grew longer, until on occasion I was walking 2-3 miles at a time, and at least 40-50 minutes every day. I was able slowly return to writing poetry over the course of a couple of years and became a poetry chapbook finalist with a publication of a chapbook 17 years after my first book came out the year of my diagnosis. I was invited to write this blog. I was invited to have my own art show, and appear in other community shows. I learned how to print out cards made from my art. I started practicing yoga on a daily basis again.I moved 3 times and ended up at the Oregon Coast. 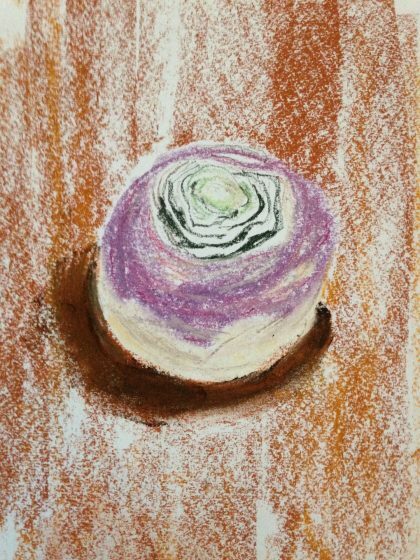 But this year it makes me smile to think that all I want to do to celebrate all these massive shifts is share this sketch of a single rutabaga. Rutabaga is one of those vegetables we didn’t eat growing up, probably because my father didn’t want anything to do with it. (Same with rhubarb and persimmons.) I’d had some once in a winter vegetable bake but remember it being hard to cut up. Here at the coast, I go to the grocery store each week with friends who like rutabagas. Still, I wasn’t planning on buying one or eating one. I was picking out a parsnip instead (another veggie I never had as a child and was sold on when a local farmer had me taste hers–which were wonderful–like her turnips–yet another one I never ate until my 50’s–) when this rutabaga next to them caught my eye. I thought it was just so pretty and fascinating that I decided to take it home and try to draw it. It’s not easy to draw rounded things. If you go look at those pomegranate drawings you’ll see what I mean. Since then I’ve tried drawing apples, peaches, pears, squash. It’s all good practice, with mixed results, some better than others. But this little rutabaga–well, I feel like I “got” its volume in this simple sketch. After being satisfied enough with the sketch, I decided to cook it last night. I was baking a couple of sweet potatoes and I wrapped the rutabaga in parchment and foil and put it on the baking sheet along with them. I learned to do this with beets years ago from Susan’s roasted beet tofu burger recipe. It took even longer than the sweet potatoes, but it got roasted whole. Today I put that roasted goodness in a sauce pan with cooked seasoned lentils, and lots of cabbage and kale, garlic and green onions. I’ve been trying to write a memoir–for years. Some of what is on the blog will be reconfigured and included but some of it is not here. In a way, working on it is like the rutabaga–it “cooks” at a geologically slow pace, and I am often fooled that what I have to say will be too “plain” or “bland” or not to the taste of many readers. And yet, the effort is also like this rutabaga in that in a certain light it’s extraordinary–at least that’s what a woman I met on the street in Portland said. She was jogging with her dog in the opposite direction Romeo and I were walking. Our dogs wanted to meet and so she stopped. We got to talking and somehow I ended up giving her a brief synopsis of the last 20 years. “You’ve lived an extraordinary life,” she said. She was sincere and insisted, when I, also sincerely, demurred. I still find that remarkable. I still find that hard to believe. To me, most of the time, my life is like that humble rutabaga in the moments I don’t suddenly see its textured splendor. One thing that’s stayed the same these last 22 years is my tendency to court those moments I do see the textured splendor in the rutabaga of my everyday life. What eating low-fat whole food and vegan these last ten of those years has given me is a clarity and ease at noticing and finding those moments, and making the most of them. In turn, that kind of moment gave me the inspiration to try eating this way in the first place. I guess that is extraordinary in some way, but just how it is becomes the challenge of the writing and the art–the rounded mystery, really, at the heart of my life. And so, happy anniversary to me, rutabaga and all. Thanks so much for this blog, Maria – I’ve loved reading your posts over the years. Thank You, Erica–that means a lot to me!! Many blessings to you on your anniversary of healthy eating. I look forward to reading your memoir! So happy for you Maria. Hi Maria: I live on the Oregon coast too in Oceanside. Where do you live? Somehow I missed the part about your moving to the coast. HI Jill, I live a ways south of you–a few hours I think.